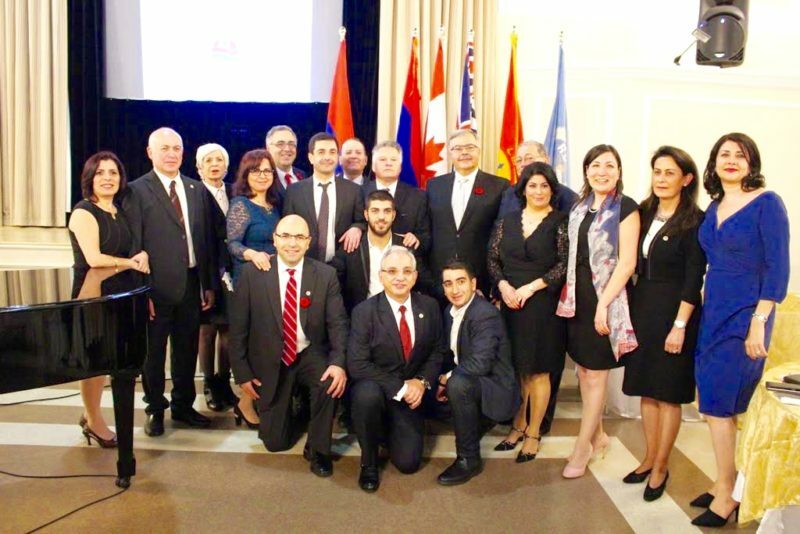 Vancouver.- On Saturday evening the Armenian National Committee of Canada (ANCC) Western Region organized a fundraising event celebrating Music and Advocacy. Close to 100 friends and supporters of Hai Tad gathered at the Armenian Community Centre Lazarian Hall to be informed and entertained. MC Hagop Deragopian introduced ANCC’s national areas of advocacy. Invited guest speakers were ARF Canada Central Committee chairperson Raffi Donabedian, Executive director of Armenian National Committee of America (ANCA) Aram Hamparian And ARF Bureau member Hagop Der Khachadourian. During the evening, “Honourary Armenian” awards were presented to two politicians who have supported the Armenian community locally. The first was Hon. Linda Reid, long time MLA for Richmond, and currently the Speaker of the House in the BC Legislature. The second was MP Don Davies, who has shown steadfast support for Armenian Canadians and Armenian issues for many years. Don travelled to Armenia for the 100th commemoration of the Armenian Genocide in Yerevan. Long time community founding member and Church benefactor Mr/ Sahag Savo Lazarian was given the ANCC Western Region’s highest honour. He was awarded the “Lifetime Achievement Award” for his more than 50 years of dedicated service and support and philanthropy to the Armenian Community and the Armenian Cause. Lazarian Hall is named to recognize the contributions of his family. For the Musical concert, the attendees were treated to the talents of two world-class musicians. Composer , songwriter, pianist Armen Martirosyan and Solo Violinist Samvel Yervinyan enthralled the audience over three sets of music. They played a combination of Armen’s famous compositions, classical Armenian favourites, and brand new pieces. Vahe Agopian accompanied them on Classical guitar during their third and final set. Over $40,000 was raised to support the ANCC, making total ANCC fundraising this year over $280,000.